Sydney, the largest city in Australia, is made up of hundreds of smaller suburbs, each with their unique attractions. Situated on the Lower North Shore, Chatswood is one of the many great Sydney suburbs to live, only 10km north of Sydney’s CBD. It’s a busy area, being an administrative centre for surrounding suburbs like Willoughby, chances are if you live here your life is nonstop! The pressure of a full-time job and other commitments hardly gives you enough time to spend with family. The last thing you want to be spending time on is waste removal, these old/broken unwanted items shouldn’t be wasting your time! 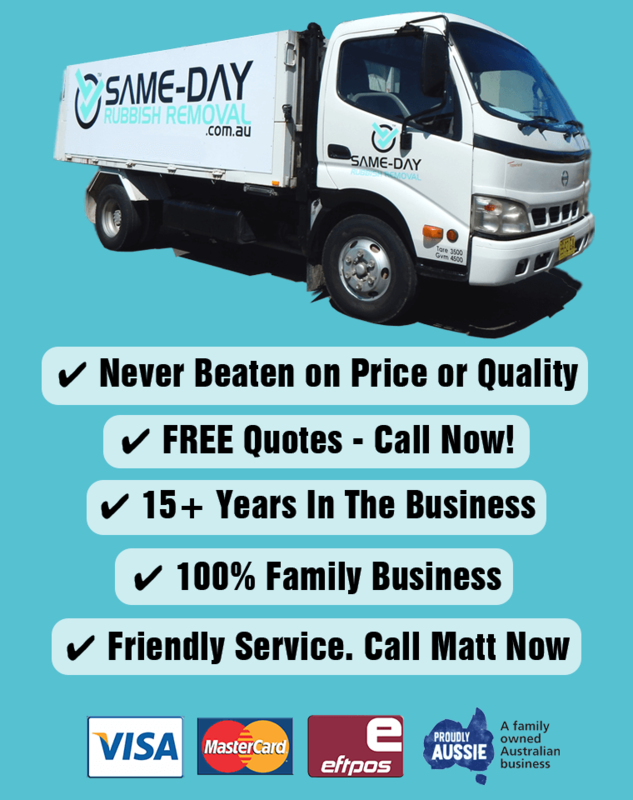 Save time and effort by give Same-Day Rubbish Removal a call. We’ll have your place cleaned up in no time, and if you call us early in the day, we will be able to come and take your junk away on the same day! There are many reasons why a professional junk removal service like ours is a much better idea than trying to clean up yourself. There are unexpected costs when taking your waste to the tip yourself, but the bigger problem is that it can take a lot of time and effort to make it happen. Skip bins can also be quite costly depending on how long you have the bin sitting in your yard, it also requires you to do all the heavy lifting of your junk out of your house and up and into it. 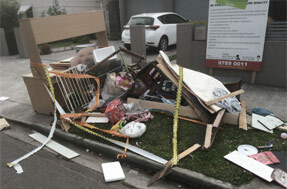 When you have Same-Day Rubbish Removal come and collect junk from your Chatswood property, you have absolutely nothing to worry about. We do everything for you – if you’ve got a large and heavy old couch that may be difficult to remove, our team can save you from breaking your back over it, we do this sort of thing every day. We don’t like to leave a place until it is looking spotless, just point out what you’d like to get rid of, and our team will have it gone. If you don’t actually live in Chatswood, don’t worry – we’re the cheapest, fastest and easiest waste removal service in all of Sydney. Whether you’re next door in Willoughby, South-West in Campbelltown, or a business in the middle Sydney's CBD, our great rates are available to you. No rubbish removal job is too hard for us, we’ve come across just about everything in the last 10 years we’ve been working in the area, and so far, there hasn’t been a job that we have had to leave unfinished. Common jobs include old furniture, whitegoods, and e-waste, but we’re happy to take away just about anything! You’ll also be pleased to know that we do everything possible to dispose of your junk responsibly, if it can be recycled, we’ll try to make sure it happens. 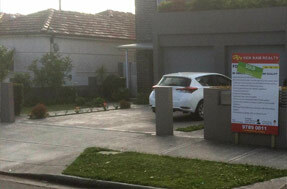 If you’re ready to have your place cleaned up, give us a call now on 0402 737 046. We’ll provide you with a free quote that will seem almost too good to be true!